Bakkhali is a small beautiful tourist spot situated on the seashore of Bay of Bengal in south 24 Parganas District of West Bengal. 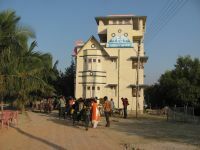 Bakkhali is a popular as week-end tourist spot. It is approximately 132 kms away from Kolkata. The sea beach in Bakkhali is very calm and quiet with gently rolling waves which attracts the peaceful minded tourists. 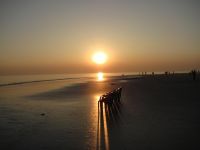 This beach is one of the two beaches situated in West Bengal. The beach is about 7 kms long from Bakkhali to Frasergunj. Except during the week-ends and holidays, the tourist gatherings is in small scale in this spot. The beach here is hard which is suitable for cycling and driving. One can reach Frasergunj from Bakkhali by a long walk of 7 kms through beautiful beach of silver sand. Bakkhali is a spectacular seaside tourist spot with Casurina groves lined up creating panoramic views and is famous for its sunset. It is situated on one of the detaic islands spread across the Southern Bengal with most of the islands situated in Sunderbans. The numerous Red Fiddler Crabs crawling on the beach makes the beach area look red and vanish into their holes as you go near them..
How to Reach – Bakkhali can be reached by train and roadways transportation only as the nearest airport is about 134 kms away. By Air – The nearest airport to Bakkhali is Netaji Subhas Chandra Bose Airport at Dumdum near Kolkata which is approximately about 134 kms away from Bakkhali. By Train – Bakkhali can be reached by train from Sealdah south section to the nearest rail station Namkhana which is about 109 kms from Kolkata. From Namkhana you have to cross Hatania-Doania river by ferry service to reach Bakkhali which is 25 kms from Namkhana. It takes about 1.30 hours to reach Bakkhali from Namkhana by road. The trains from Sealdah via Lakshmikantapur and Kakdwip to Namkhana starts at 4.40am, 7.30am, 10.30 am and takes about 3 hours to reache Namkhana. From Namkhana railway station you can reach Namkhana ferry ghat by Van Rickshaw to cross Hatania-Doania river by ferry service. The ferry service is available from 7am to 11pm except from 12 noon till 1:45pm (lunch hour). After crossing the river you can reach by bus or trekker which will take about 1.30 hours to reach Bakkhali from Namkhana by road. By Road – Several buses of WBSTC ply from Kolkata Dharmatala Bus terminus near Shahid Minar from 7.00 am morning to evening at regular intervals. WBSTC Buses also ply from Garia and Howrah. SBSTC buses also ply from Belgoria depot. All the buses take approx. 4 to 4.30 hours to reach Bakkhali. The route of the bus is Dharmatala- Alipore-Chiriakhana-Taratala-Diamond Harbour-Kakdwip-Namkahana-Bakkhali. The 130 km stretch from Kona expressway and Bakkhali has been marked as National Highway (NH) 117 with links to the Mumbai and Delhi sections of the golden quadrangle project linking the four metros of India. Several local buses also go upto Namkhana and others from Namkhana to Bakkhali. Season – Bakkhali can be visited throughout the year but the best season is July to March. Clothes	Cottons all year round except during December- January when light-woolens are required. Local Watchables – At Bakkhali the only mode of transportation to visit the local tourist spots is by Rickshaw Van. You can visit the places of interest by hiring a Rickshaw Van from Bakkhali. Bakkhali is a good place to relax, stroll on the beach and enjoy the local cuisine. There are a few places to visit in and around Bakkhali. Frasergunj is a 7 km long beautiful and sliver sand beach from Bakkhali. The walk over the beach from Bakkhali to Frasergunj is a out-of-the-world experience. Jambu Dwip – You can visit Jambu Dwip from Frasergunj fishing harbour by motor boats locally called Bhutbhuti. Jambu Dwip is a small virgin forested island out in the sea. The tour to Jambu dwip is very thrilling and takes two hours ride up & down by local Bhutbhuti. This 8kms long & 2 kms wide island is made of mangrove forests like Hetal, garan, sundari, geon and consists of wild animals like chital, sambar, wildboar which are rare to site. Henry’s island – Henry Island is a 10 minutes drive from Bakkhali. You can also visit this place by Van rickshaw who will describe you the brief history about this place if you want to listen from them. Henry Island is a lush green area covered with 50 big ponds locally called “Dighis” where Fisheries Department of West Bengal which has set up a pisciculture project here. At Henry Island Fisheries Department of West Bengal has three rest houses namely – Hetal, Garan, and Sundari where the tourists can stay in peaceful greeny atmosphere. You may contact State Fisheries Development Corporation, Bikash Bhavan, Kolkata, Phone: +91-33- 23376470 to book rooms here. Entry Fee at Henry Island is Rs 5 . The department has planted trees like gora, kankru and palm apart from naturally growing sundari and hetal.Henry Island is named after a European who surveyed land in the area in the late 19th Century and the island was only an extension of the Sunderbans. There is a watch tour in Henry island from where the entire Sunderban area can be watched. You can visit the Benfish harbour and Frasergunj Beach on the way to Henry’s Island . One can also visit the Crocodile Park and Mangrove forest just beside the Bakkhali Bus stop.Entry fee Rs 2/-. The trip in Van Rickshaw takes you through the local village life which is very interesting to watch. There is a Bishhalakshmi temple at the end of the Bakkhali beach which is also a good spot to visit. Diamond Harbour – 82 kms. Frasergunj – This peaceful sea beach is situated at a stretch of 70 kms from the north of Bakkhali. Sir Andrew Fraser, Lieutenant Governor of Bengal in the early twentieth century have discovered this place. He tried his best to popularise it and in recognition of his efforts a part of the town is named Frasergunj. There is a remains of Sir Andrew Fraser’s house near the beach, which according to the locals was the one in which Fraser used to stay. According to the local legend Sir Andrew Fraser accidentally landed to this place after a shipwreck and local woman named Narayani helped him to survive. Frasergunj was earlier known as Narayanitala. 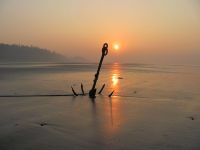 The beach in Frasergunj is very straight with low tides and is ideal for week-end tours. Fishing is the primary occupation of the local people as the salty water of the sea destroys the fertility of the land. There is a fishing harbour at Frasergunj and a wing of the state government named Benfish is operating in the area. The windmills in Frasergunj generate power for the locality. The wind mills are visible from many places all around. Some of the hotels use solar heaters for heating water. The rickshaw van is the only form of local transport. Buses and trekkers are the other means of transportation for the local people. The fising nets are spread on the Frasergunj beach to dry them after fishing which makes it colorful. Early at dawn the fishermen used to go to the deep sea for fishing in small boats with motors. During the sunrise the image of the early sun on the sea water and beach with boats all around look beautiful and picturesque. The smell of dried fish makes the environment a little bit uneasy as it is one of the primary occupation the local people. 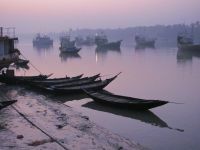 Sagar Island – Famous for Gangasagar mela. Sunderbans National Park – Largest mangrove forest in the world with the site of Great Royal Bengal Tiger and crocodiles, gharials etc. This entry was posted on Sunday, February 21st, 2010 at 12:17 am	and is filed under General. You can follow any responses to this entry through the RSS 2.0 feed. You can leave a response, or trackback from your own site. A very exotic and attractive place. It is a sweet spot for weekend. You can enjoy it very much. One thing is very remarkable that the local people are very co-operative. Food price are not high all in meal system. Meal starts from Rs.35 to Rs.150. I wish Bakkhali will be a beautiful tourist spot in future. See the beautiful Silver beach.